It’s that time of year again! EAA AirVenture 2013 – The World’s Greatest Aviation Celebration – is scheduled for the end of the month, July 29th through August 4th. AirVenture features more than 10,000 aircraft, including the world’s only airworthy B-29 Superfortress; daily air shows; nightly entertainers, such as Chicago and Gary Sinise & the Lt. Dan Band; forums and hands-on workshops; a special screening of Disney’s Planes, and so much more. 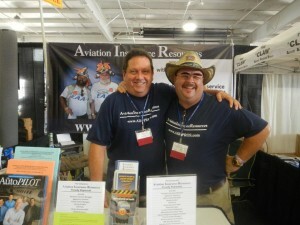 Learn more about EAA AirVenture 2013. As usual, Aviation Insurance Resources (AIR) will be in attendance at booth #1141 in Building A You know that AIR offers a wide range of aircraft insurance options for aircraft of all makes and models, from experimental aircraft to standard aircraft such as Cessna Aircraft, Beechcraft, and Cirrus Aircraft to Robinson Helicopters, Piper Cubs, and Corporate Aircraft. We are always happy to meet our customers and pilot friends. Stop by for a free quote, get answers to your insurance questions or just to tell us your favorite flying stories! To find out more about EAA AirVenture 2013 in Oshkosh or Aircraft Insurance, please contact Aviation Insurance Resources by calling 877-247-7767 or visit AIR-PROS.com today to receive your free Aircraft insurance quote! You can also follow us on Facebook, Twitter, LinkedIn, Pinterest, and Google+.